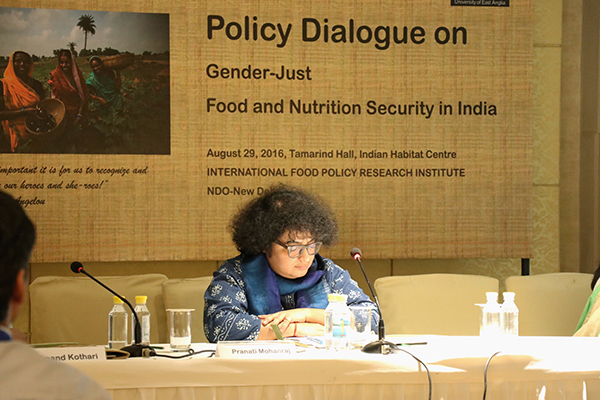 Dr. Lekha Chakraborty, faculty of NIPFP, chaired a session on “Women’s Empowerment and Food Security” organized by International Food Policy Research Institute on ‘Gender Just Food and Nutrition Security in India’ meeting on August 29, 2016 at Tamarind Hall, Indian Habitat Centre, New Delhi. The meetings carried out the discussions which were key for empowering women in agro-food systems and brought together national policy makers, researchers, donors and implementing agencies to present the most recent evidence on gender and food security in India that will contribute to the ongoing local policy debate on women aspects. Some of the important themes that had emerged after the selection of research briefs which could contribute towards policy making were gender, drought and food security; gender and social safety nets (e.g., Public Distribution System and MNREGA); gender and the labour market; gender and agricultural technology adoption and maternal entitlements. Dr. Chakraborty has also been on the panel to take the IFPRI agenda forward for Policy and Practice on gender just food and nutrition security in India.